The sheer size to stamp this part was causing production issues at the customer's own manufacturing facility. Serious concerns that an outside supplier would be unable to meet their strict cosmetic standards was keeping the stamping operations in-house. Select a tooling shop that could design and build a die of this magnitude. Select a stamping manufacturer with the capability and capacity to produce the side tables. The first part of this project involved designing and building a die equipped with durable components and accurate in-die sensors to handle stamping the side tables. The hemmed and boxed design of the side tables made it a more complex part. Ultra’s design team created a 144-inch progressive die with multiple stations. The design process directed the press to first cut the metal, second form it and finally push it off the die at a productive speed. 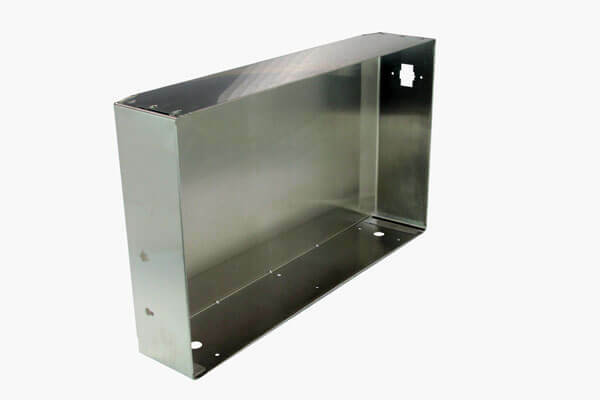 A key component to maintaining the customer's high cosmetic standards was locating a steel supplier that could provide plastic coating on one-side within a specified thickness. The cosmetic standards were also met by utilizing our facility’s dust collection system to pick up plastic and metal shavings throughout production. Ultra was able to meet all the customer’s goals with our all-inclusive services; design, die building and production. The customer didn’t have to spend significant time locating separate suppliers for each service they needed. Cosmetic standards were met for the side tables and maintained the overall appearance requirements for the final product.